On October 6 and 7, the Cortland community came together to start off the fall season with the Great Pumpkinfest. The festival featured craft vendors, live music, hayrides and of course, a lot of pumpkins. However, the biggest star of the event was the food. Festival-goers had a large selection of food to choose from, including pizza, fries, funnel cakes and freshly popped kettle corn. One of the stands serving kettle corn was run by Emily Swancott and her mother, Joanne. Swancott has worked alongside her mother since they started Cross River Kettle Corn nearly a decade ago. The pair spends the end of summer and early fall selling kettle corn. Swancott said that they decided to start selling kettle corn because “we were trying to think of something that we could take to farmers markets and carnivals and things like that." Another family-run stand at Pumpkinfest was S & S Syrup. Steve and Susan Dellow have been making maple goods for about 30 years and have sold these products at Pumpkinfest since it started in 1996. "We sold out yesterday, so we had to make more this morning," Susan said about their maple sugar treats. Steve said, with a laugh, that he enjoys coming back to Pumpkinfest every year because of "the people and to make a little money.” His wife chimed in to emphasize that the people and the community coming together are the most important part of the festival. A sense of community might be the best part of this event for some, but that isn’t the actual purpose of the festival. The purpose of Pumpkinfest is to celebrate bounties of the harvest season. As one would expect, pumpkins are a huge part of the bounty local farmers bring in at the beginning of October. ​Pumpkins were used mainly as decorations all over Courthouse Park, but some vendors were also selling pumpkins. Festival goers could purchase plain pumpkins or ones painted with faces. Despite the name of the event, there was very little pumpkin food at Pumpkinfest. First-time Pumpkinfest attendee Melissa Walters said, "The food was really good, but I was kind of disappointed there wasn't more pumpkin related food. 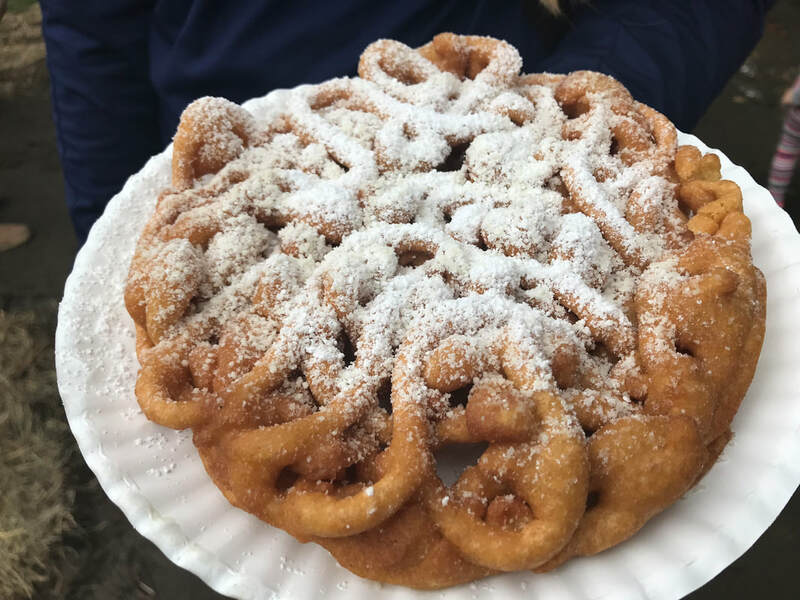 Other than the funnel cake there really wasn't anything." A fair-style funnel cake truck was the only food vendor advertising pumpkin related food. The rest of the food stands included local restaurants, homemade treats and stands that are commonly found at festivals and fairs throughout the year. Even though the lack of pumpkin-flavored food was a bit disappointing for some, local pumpkin farmers kept with the overall theme of the event by sharing their harvests with the community. 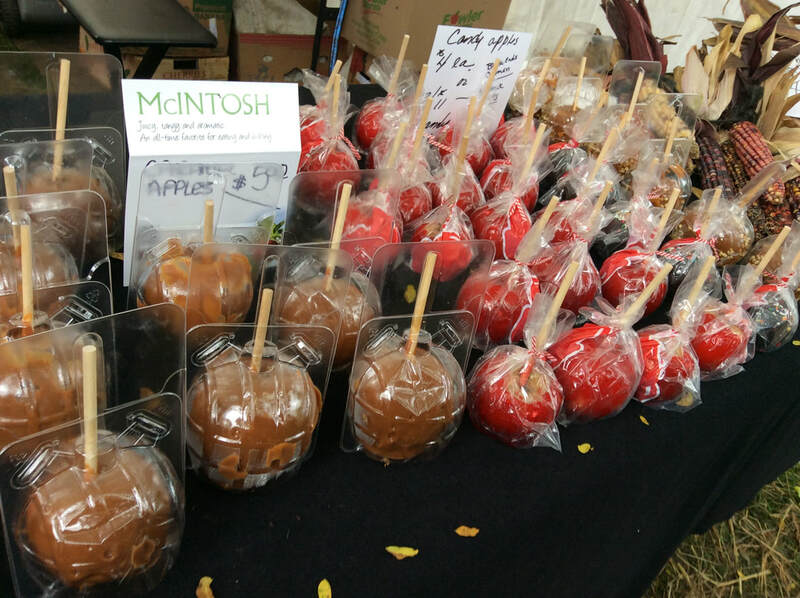 One of the most abundant crops in Upstate New York around this time of year is apples, so it isn't very surprising that more vendors were selling ready to eat apples than pumpkin-flavored goods. Two different vendors were selling caramel and candy apples, and they happened to be right next to each other. Hundreds of people attended the festival, so there were plenty of customers for them to share.